WASHINGTON—U.S. President Donald Trump on Dec. 4 held out the possibility of an extension of the 90-day trade truce with China but made clear he would revert to tariffs if the two sides could not resolve their differences. 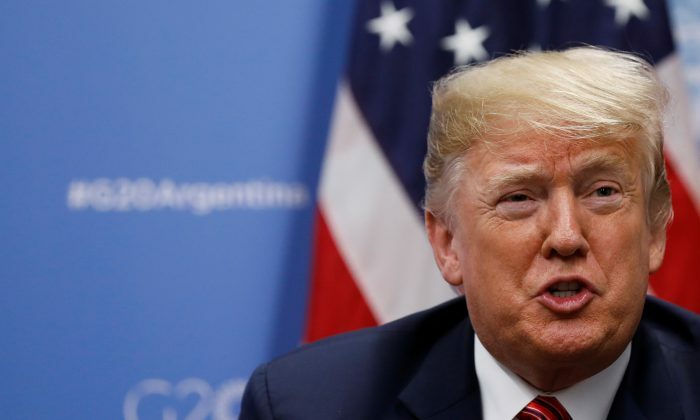 Trump said his team of trade advisers led by China trade hawk U.S. Trade Representative Robert Lighthizer will determine whether a “REAL deal” with China was possible. The Republican president indicated he would not be opposed to extending the 90-day truce he and Chinese leader Xi Jinping agreed on over the weekend. “The negotiations with China have already started. Unless extended, they will end 90 days from the date of our wonderful and very warm dinner with President Xi in Argentina,” Trump said on Twitter. Trump and Xi on Saturday agreed to the ceasefire in a trade war that has seen the flow of hundreds of billions of dollars worth of goods between the world’s two largest economies disrupted by tariffs. The two leaders said they would hold off on imposing additional tariffs for 90 days starting on Dec. 1 while they seek a solution to their trade disputes. White House economic adviser Larry Kudlow said on Tuesday that a reduction in Chinese tariffs on U.S. cars and agricultural and energy commodities would be a “litmus test” for whether U.S.-China trade talks are on track to succeed. The United States also expects China to promptly address structural issues including intellectual property theft and forced technology transfers, U.S. officials have said. “So, again this will be a real agreement again and not that we can accomplish everything in 90 days but we expect to make a lot of progress and President Trump will be directly involved,” Treasury Secretary Steven Mnuchin told Fox Business Network on Tuesday. His appointment of Lighthizer to lead the talks instead of Treasury Secretary Steven Mnuchin puts one of the administration’s toughest China critics in charge. Trump said on Tuesday that Lighthizer would work closely with Mnuchin, Kudlow and trade adviser Peter Navarro.